Natural progesterone, now referred to as bio-identical progesterone, is structurally the same as human progesterone and releases the full range of biologic activity of hormone produced naturally by the body. Transdermal progesterone passes through the skin into capillaries in the underlying fat layer and is passively diffused into the blood stream. In contrast to oral progesterone which is subject to removal by the liver, transdermally-applied progesterone escapes this first-pass effect to retain potency when modest amounts are used. Progesterone deficiencies may occur in association with disturbances in premenstrual and menopausal health. Progesterone facilitates bone deposition while balancing the effects of estrogen. Natural progesterone is just as effective as, and much safer than, synthetic progesterone. 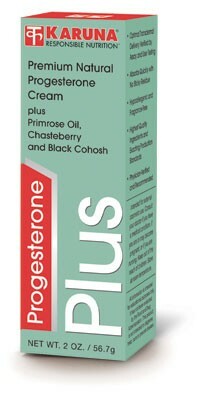 Supportive factors in Progesterone Plus include primrose oil and extracts of chasteberry, wild yam, and black cohosh. Karuna Progesterone Plus is free of alcohol, parabens and urea. Each 2 oz. tube is standardized, quality-controlled and safety-sealed to prevent oxidation and bacterial contamination. Each 2 oz. tube contains natural progesterone USP (25mg per ¼ tsp. ), which applies easily and absorbs rapidly into the skin, leaving no sticky or oily residue. Each tube is accompanied by an educational brochure that contains complete dosing instructions and other valuable information. Suggested use for adults: Progesterone, being a small, fat-soluble molecule, is easily absorbed through the skin. For general application, skin sites recommended include the inner areas of the thighs and arms, neck, upper chest and abdomen. The site should be rotated daily for maximum absorption. Allow 2-3 months for maximum effect. Ingredients per 2 oz. tube: Purified water, Organic Jojoba Oil, Organic Aloe Leaf extract, Organic Shea Butter, Cetyl Alcohol (coconut oil derived), Stearic acid (palm kernel derived thickener), USP Progesterone derived from Wild Yam (Dioscorea villosa) Root extract, Evening Primrose Oil, Sodium Hydroxymethylglycinate, Disodium Edetate, Potassium Sorbate, Xanthan Gum, Tocopheryl Acetate (Vitamin E), Organic Black Cohosh extract, Chasteberry extract. 56 servings 1g (1/4 tsp. supplied) with 25mg of progesterone per serving.